Well, it is that time of year again. The early spring flowers are coming up. An of course that means our flower gardens are jam packed with tulip bulbs and daffodils. If we did not plant them (and we did not) then you like the neighbors may wonder how all those bulbs got there. The villains of course are those wicked little rodents called squirrels. I swear they go all around the neighborhood and dig up everyone’s bulbs and bury them in our flower garden and some in our yard. Now, there is barely any room for any other flowers. The strange thing is though that they dig up the flowers from the neighbors that feed them and plant them in our garden while I am constantly shooing them away. So, I am not a thief, it truly is the neighborhood squirrels that are doing it. I do not care how strange the look I get in the neighborhood when I explain that to them. P.S. The neighbors believe me due to the fact that one of them stood there talking with me and we watched one of these tiny thieves dig up one of his bulbs and dash over and bury it in our garden. Categories: Christianity, humor, Uncategorized | Tags: Animals, flowers, garden, humor, neighbors, squirrels, thieves, villains | Permalink. Then He said: “A certain man had two sons. And the younger of them said to his father, ‘Father, give me the portion of goods that falls to me.’ So he divided to them his livelihood. And not many days after, the younger son gathered all together, journeyed to a far country, and there wasted his possessions with prodigal living. But when he had spent all, there arose a severe famine in that land, and he began to be in want. Then he went and joined himself to a citizen of that country, and he sent him into his fields to feed swine. And he would gladly have filled his stomach with the pods that the swine ate, and no one gave him anything. We adopted a cat we call Sammy. He is always, loved and well cared for but one day snuck outside and refused to come back in. The outside world looked too inviting. He has no front claws to defend himself against the wild cats and cannot hunt. Christians are adopted and well cared for by Jesus. For some the outside world looks tempting and they leave. Just as I searched for and tried to coax Sammy in to no avail so too does the Holy Spirit. Just as I gave up and walked away so too does the Holy Spirit give up and walk away from us when we refuse to obey His calling. Just as Sammy will be welcomed back so too are wayward Christians when they repent and come back to Christ. 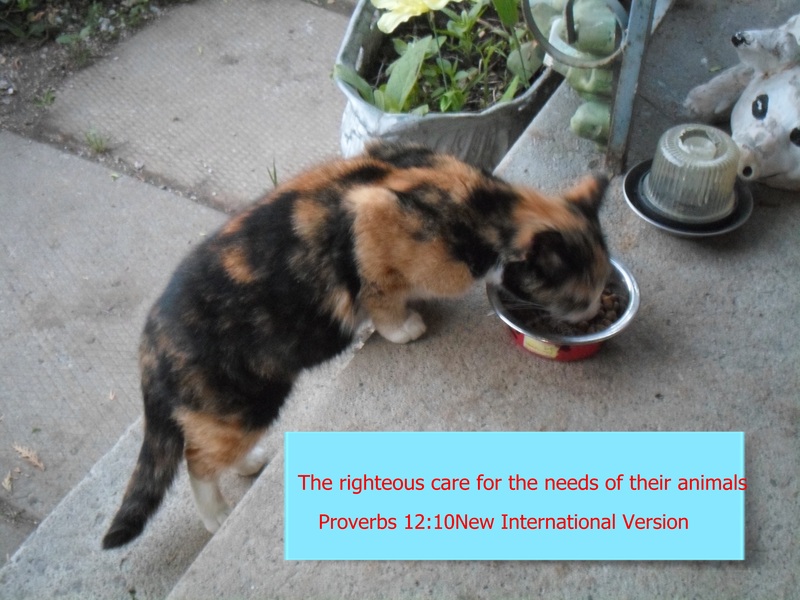 Categories: Christianity | Tags: Animals, assurance, Blessings, cat, Christian, Christian family, Christianity, devotions, God, grace, Holy Bible, Holy Spirit, Jesus, love, obedience, photography, prayers, quotes, repentance, sermons, sin, temptations | Permalink. Christ will not accept anything but total worship, there is no half way with Him. Either dedicate your life totally to Him or do not waste your time because He only accepts all of your devotion. There are many Baals in life that are thieves and steal worship that only belongs to Jesus in many Christians lives. Many worship sensuality,it pollutes in movies, music and on TV. They change bed partners more than they change their underwear. What is the end of this destructive god you worship? You will not get to pick your poison, syphilis, gonorrhea or aids but you do get to accept in full the reward of following this harlot all the way to Hell. Many worship worldly pleasures like mobile phones, fancy clothes, expensive cars, and houses they cannot afford, which means they become slaves to the bank to attain these dead gods. Go ahead fool, look at these gods and say: “I love you.” and see what their reply is. Many sacrifice their souls on the alter of material wealth. They slave away for that extra dollar because they want to depend upon this useless god to take care of them in luxury. Where are they when you have sacrificed your mind, body and spirit to them and they are taken from you like dainty snow under the blistering heat of the noon day sun. Many treat the scriptures like dung and worship faulty worldly knowledge over Jehovahs supreme pure Divine wisdom. They mock it, call it absurd and foolishly laugh at it. Jehovah has the last laugh as His word confuses you and you realize that those who profess to be so wise are actually nit wits. Many worship creation (putting animals on equal ground as humans. How many foolishly call infant animals babies and treat them as a child and have more devotion towards them than they do their fellow man or woman?). Oh how they wail when they have to put their gods down because of old age or disease. When you become sick or in need of help to pay your bills where are they to help you? How many absurdly call it mother nature instead of Jehovahs creation? Can mother nature bring you rain in season, sun in season or snow in season? Yes, I have prayed for rain and the prayer was answered in the affirmative. The weather forecast indicated that mother nature was going to bring us a hot sunny day. Whose god was more reliable? Jehovah refuses to play second fiddle to any of them. Prayer: Unto You and You alone do I swear my utmost alligence to Jehovah Eli (Lord my God). There is none equal to You much less supreme to You in my life. You are indeed the most cherished of all the treasures in my life. Thank you for this esteemed privilege in the name of He with whom I adore as much as I do You, Jesus Christ. Amen. Categories: Christianity | Tags: absurd, AIDS, Animals, assurance, Blessings, body, Christian, Creation, dedication, destruction, Devotion, devotions, disease, dung, following, foolishness, fools, God, gonorrhea, grace, Hell, Holy Bible, Jesus, knowledge, life, love, mind, mock, movies, music, old age, opinions, photography, pleasures, poison, pollution, prayers, quotes, rewards, sacrifice, scriptures, sensuality, sermons, slavery, spirit, steal, syphilis, thieves, TV, wealth, worship | Permalink. Proof That Animals Will be in Heaven. This is proof that we will be in physical bodies when in Heaven and that animals will be there with us. I do not know if our beloved pets will be there but sure hope so. Being an animal lover I look forward to the day when I can walk amongst all animals with no fear and look forward to the day I can play with a tiger or lion. Which animal do you look forward to playing with? Prayer: Oh Jehovah Elohim (God our creator) how I long to be in the perfect creation that awaits me in the Heavenly home You have so graciously prepared for me and to enjoy the creatures there in perfect peace, love and joy. I eagerly anticipate thanking You in the name of the King of this amazing place Jesus Christ. Amen. Categories: aimals, Christianity, compassion, Creation, destiny, divine plans, encouragement, gladness, Gods grace, Gods will, happiness, heaven, Holy Bible | Tags: Animals, Creation, love, pets | Permalink. He Cannot Do Them All.